I am always looking at faster ways to sharpen my knives. Bench stones are great, but I am not accurate enough to get the angles correct and hold the blade perfectly while sliding across the stone's surface. The next level of jiggy-ness is a system like a Lansky Deluxe, Gatco Edgemate or a high-end Edge Pro Apex system. The Lansky and Gatco's offerings of these systems are similar. A guide that clamps on the blade and honing stones that run on rods through the guide. A Lansky Deluxe runs in the $40 to $50 range at popular outfitter shops such as Cabela's or Pro Bass Shops in Canada. A few reported issues with the system are the rods sometimes become bent and need to be straightened perfectly straight. The other issue is that the slots on the guide do not allow for micro angle adjustments. Lansky Deluxe has angles of 17, 20, 25 and 30 degrees which is okay for most people. But, if I wanted to do a 22.5° angle it's not that easy. Another issue I have with this system is the finest hone I could find is 1000 grit. Probably ok for most, but I'd like the choice for finer ceramic hones. Edge Pro Apex hails from the USA for a hefty price tag of around $300 landed. A bit more than I can chew right now, but I was reading a knife forum from the UK one member there mentioned the Ruixin Pro is a knock-off of the American model, and for $51 with free shipping I thought I would give it a try. In the event the Ruixin stones wear out, the Edge Pro uses compatible stones of similar dimension. I ordered the Ruixin Pro Knife Sharpening System from a vendor on Amazon.ca. It was shipped via DHL and arrived in hands in four days, air-freight from China. The box was a bit beat up and was opened by customs and then re-sealed. I was concerned about the contents and shipping damage. Everything appears to be in good order. Nothing broken and all the items we're secured in the box with fairly decent packaging. Note the instruction manual is included. I was expecting this to be poorly translated, but I have to give them 4 stars for a fairly well done manual with sketches and clear explanations. Inside the pouch are four stones, a permanent marker, the pivot rod and the support bar. The support bar helps keep the unit stable acting like a leg. Stones (hones) provided are 120, 320, 600 and 1500 grit, which the manual recommends using with water. After checking the dimensions of the stone, I determined that these stoned are interchangeable with the Edge Pro Apex type stones at 6" long. That would expand the range of grits and abrasive materials dramatically. The manual is clear and has good illustrations. This was unexpected. The system as a whole seems stable. The stone is fitted into the rod between two holders and the ball is turned to tighten the it firmly into place. I wasn't expecting much from the suction base, but this works quite well. I am pleasantly surprised! A good yank on it and I could not pull it off the table without releasing the vacuum. The blade table (where the blade rests) is adjustable. Loosen the thumbscrew and adjust the stainless steel plate, then tighten again. This seems to adjust okay. There is a piece of protective nylon to prevent the blade from being scuffed by the plate. Markings on the pivot rod are at 10, 15, 20, 25 and 30°, but can be adjusted to any angle simply by unlocking and sliding the rod up or down. In the case of a new blade, I will simply set the the pivot rod to a suitable angle and start making the cutting edge. With a blade that has an existing bevel, we want to match the angle of that bevel. A permanent marker (provided) is used to paint the cutting edge. Then, with the knife resting flat on the blade table a test stroke is made. How much of the marker is removed will indicate whether the angle of the guide rod/stone needs to be adjusted. Once the angle is adjusted so that the stone is in full contact with the bevel face we wet the stone with the cloth and start. With this neglected chef's knife, I worked both sides starting at the 120 grit stone. I use the cloth to wet the stones before using, then wiped them afterwards. The sliding of the stone is done in the direction shown. This takes a little practice. It should be noted that some dexterity is required. At first it felt awkward to switch to left hand strokes, but after a few minutes I got the hang of. Very lightly (with the only weight of the stone) glide the 1500 stone over the sides with 1500 and you're pretty much done. A leather strop would take it to the next level, but this large chef's knife came out box-cutter sharp on the 1500 grit. Although I have never used the Lansky Deluxe kit or Edge Pro Apex system, I can compare this Ruixin Pro unit to my Gatco Edgemate of similar price. The Ruixin Pro is miles ahead. As a knifemaker, I would recommend this product to other knifemakers who are getting started or working in a limited budget. 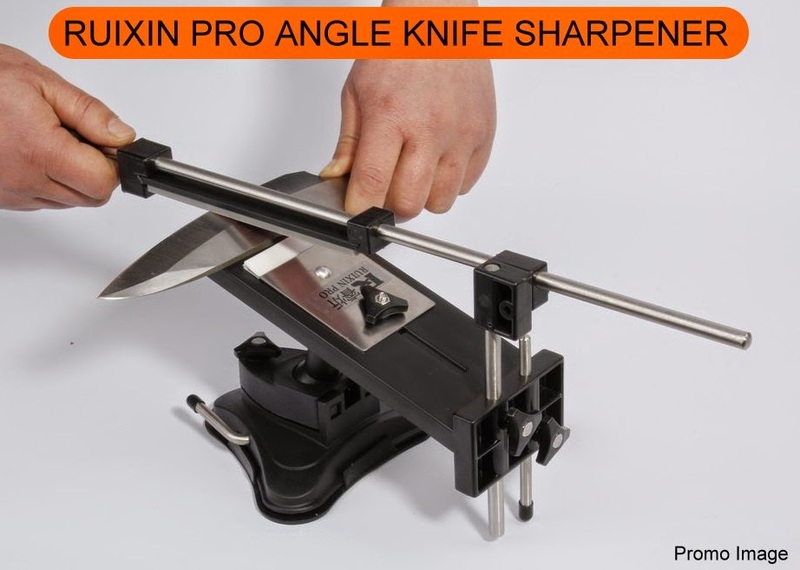 At under $50 the Ruixin Pro Knife Sharpening System is a bargain. US visitors I have found this product on Amazon.com: Professional Kitchen Knife Sharpener System. Even at twice the price I feel this kit would be worth the money. Prices certainly vary, so if you are interested shop around. I have also found that replacement stones can be bought on Amazon.com. A friend has recently bought the all steel version and likes it very much. It is great to see your helpful detail about the subject, here also I was visit Couteau-de-chasse for the shopping of knifes. Great recommendation. Got mine from the UK for about $24:00 and it is really nice to work with. 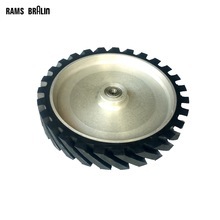 I would like to congratulate you for this Useful tips.You can't have a blade that doesn't fit well in your grasp,I mean a blade is futile on the off chance that you won't utilize.I hope in next time we will get huge information what will be very much helpful for us. Just wondering if the sharpening system is still working good for you, I currenlty have a Lansky and looking to upgrade. Also how side are the stones and are they holding up good? Hi, I use mostly the 120 and 320 grit stones for setting the angle of the cutting edge before honing on the sharpening wheel with compound. The 120 is starting to cup a little bit and will need to be replaced in a few more knives. I've formed the cutting edge on about 10 knives and touched up a few dozen others, so it's good value. i just would like to say to the world, i ordered my RUIXIN PRO from amazon 6/25/15,and is the best knife sharpener i have ever owned! i swaped out the stock stones that came with this kit and replaced them with the regular edge pro ones and the ruixin pro is working grate for me,its not all the time you get a clone/copy that really works! best $40. i ever spent. Thanks for the comments Blane. I have found it to be very useful as well. Aliexpres and sell it very cheap. Search Aliexpress as LULU Sharpener. Can you explain how to set up the angle on Ruixin Pro. The rod has no presset markings. The kit comes with a felt pen marker to paint the cutting edge of a knife. When the stone is at the correct angle the stone removes the ink. For a new knife that has no edge set yet, I use a small protractor and adjust to 22.5° or whatever angle I wish to make the cutting edge. My only concern with this system is you are pushing towards the blade edge you are sharpening. Whether this is a real threat or just in my imagination is immaterial - I have made my own system which copies the basic ideas, but have replaced the round knob handle with one similar to that on a tenon saw so my fingers are better protected. I'm still capable of stupidity, but at least I tried! I have enjoyed your website and the way you share your ideas. Thank you. Thanks DC! Got the new "Ruixin Pro III" version for $19.99, all stainless. Compared it to my friend's Edge Pro and it left him sad and angry. All hail the Chinese "Mirror" copy. Everything exactly copied and improved. Got this same model and had a go at my kitchen knife collection today. What a blast. 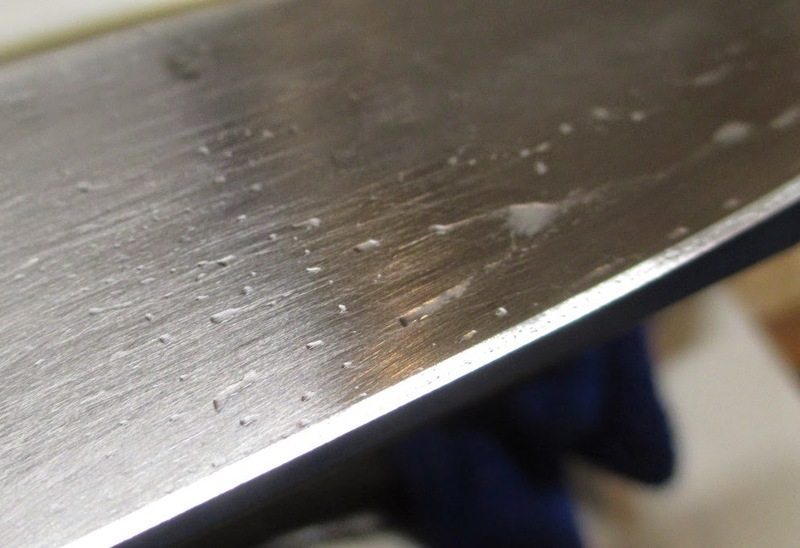 Once I got a grip on which knives use what angle, it became easy to get a mirror-polish razor edge on the blades. Where can I go for parts? Sombody?? Are you looking for new stones or is there a broken part of the sharpener itself that needs to be replaced?